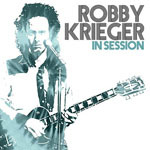 Share the post "Album review: ROBBY KRIEGER – In Session"
Like the Cleopatra release before it by Joe Lynn Turner “In Session” collects together some of Robby Krieger’s session work over the years. The Doors guitarist was always a master of restraint in terms of his guitar playing and this album is perhaps more notable for the guest appearances than any earth-shattering licks. The liner notes recount a 2016 interview where Krieger opined that “The problem with today’s music is that kids don’t really bother to learn instruments”. That is probably true and further reinforces Kreiger (and his peers) credentials. This entry was posted in ALBUM REVIEWS, ALBUM REVIEWS (Mobile), All Posts and tagged album, Billy Sherwood, Geoff Downes, guitar, guitaris, In Session, Jackson Browne, John Wetton, Nik Turner, review, Robby Krieger, rock, Rod Argent, THE DOORS, Tommy Shaw, Tony Kaye. Bookmark the permalink.